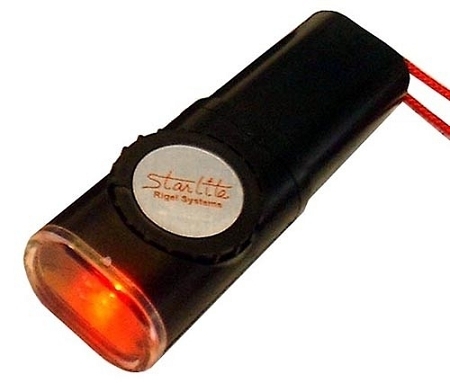 Starlite - The bestselling astronomer's flashlight with 2 Red LEDs! Rigel Systems' original astro flashlights, much imitated but never duplicated, are back! LEDs are socketed so you can easily swap in different color LEDs. Smooth & easy thumb-wheel adjusts LED brightness. Water Resistant. Dual Ultra-bright LEDs - The best and the brightest with lifetimes of 100,000+ hours, never break, and provide smooth illumination. Thumbwheel Brightness Control - Dial up just the right amount of light and extend battery life. Energy Efficient - Up to 320+ hours at the dimmest setting, 12+ hours at the brightest, from one 9V Alkaline. Exclusive brightness regulation circuitry - keeps the LEDs shining bright as batteries age, unlike competitors LED flashlights which start bright but quickly fade. 9 Volt Battery & 20" neck strap included.